Hoping to start a blog or affiliate website that you can use to generate some extra income? Before you start planning out your content strategy or doing keyword research, you’ll have to get your site up and running. Your first step? To identify which vendor or company you want to use to host your site. Assuming you’re using WordPress to set up your site, you’ve got plenty of options. 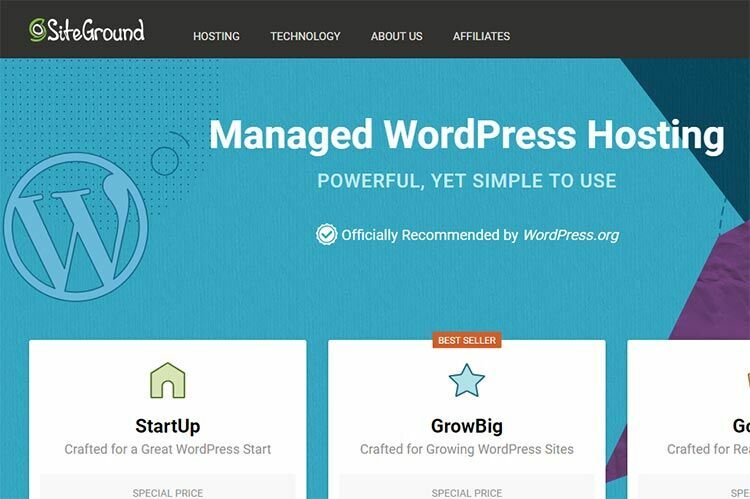 Most hosting companies offer WordPress hosting services, with some of the most popular companies being Bluehost, Siteground, WP Engine, InMotion Hosting, and Hostgator. 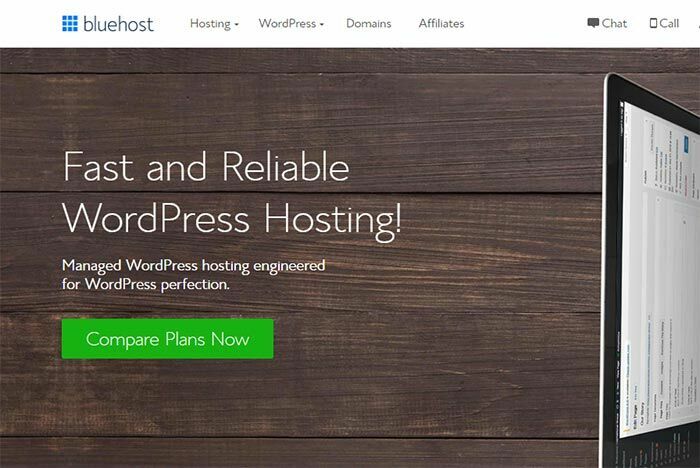 In this article, we’ll walk you through the pros and cons of each of these hosting companies, so that you can decide which is the best overall WordPress hosting service for you. Bluehost is one of the most reputable WordPress hosting companies out there; they’re even recommended by WordPress as an “official” host. The company powers an impressive 2 million+ websites from across the world, and they’re the host of choice for most first-time website owners. If you’re signing up for the basic plan, this gives you 50 GB worth of website space, unmetered bandwidth, a free domain name, and a free SSL certificate. On top of that, you also get 5 email accounts with 100 MB worth of storage per account. All in all, Bluehost is known to have a decent uptime and a fast server response time, and it’s unlikely that you’ll experience any problems with performance if your website is hosted on Bluehost. One complaint that many users have about Bluehost, though, is that they’re pretty aggressive when upselling their related products and services. If you’re signing up for a new account, and you just want to get a basic plan, make sure that you uncheck all the add-ons that Bluehost will automatically include in your cart. Pricing: The basic plan starts at $2.95 per month. SiteGround’s basic plan is pretty affordable, so you might assume that it might be less feature-rich than some of the other plans that we’ll be discussing here today. However, this isn’t actually the case. As a basic user, you’re entitled to a free setup and transfer, 99.9% uptime guarantee, unlimited emails and databases, free daily backups, free CloudFlare CDN, free app installs, free SSL certificates, and 24/7 support. Not too bad at all! Good to note: SiteGround’s sign up process is quick and painless, and you can get your website up and running in no time. We also like that the company offers a 30 days money back guarantee; if you decide to switch to another hosting service within 30 days, you can either get the amount you’ve paid applied as a credit to your account, or refunded to your credit card. That said, one disadvantage of using SiteGround is that it does not offer any free domain names bundled into its hosting packages. While you can use SiteGround to register domain names, you’ll have to pay extra for this. Pricing: The basic plan starts at $3.95 per month. Unlike the other vendors on this list, WP Engine offers managed WordPress hosting, not shared WordPress hosting. What does this mean? On top of hosting your site, WP Engine also automatically updates your WordPress software, backs up your website, and takes care of other tasks. 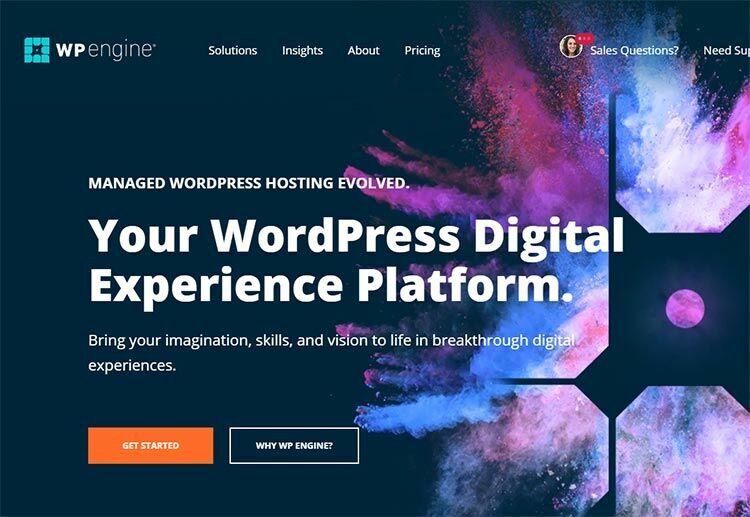 Obviously, you’ll be paying a premium for a managed WordPress hosting service such as WP Engine, but on the bright side, you get the Genesis Framework and a selection of 37 StudioPress WordPress themes bundled into your hosting plan. Given that each of these theme retails for $100+, this actually works out to be a pretty good deal. The bottom line? If you don’t mind paying for an all-in-one solution, consider hosting your site on WP Engine. If you’re on a tight budget, go with one of the other vendors instead. Pricing: The basic plan starts at $35 per month. There are several factors that make InMotion an excellent choice for a newbie blog or website owner. Firstly, InMotion has a robust onboarding process that teaches its users how to get their websites up and running. On top of that, InMotion offers 24/7/365 US-based support, which is pretty much as good as it gets. You can get in touch via email, phonecall, or live chat, and even if you write in on Christmas Day, you’ll still have someone get back to you without delay. If you sign up for a basic plan at InMotion Hosting, this gets you 40GB of SSD disk space, unlimited monthly transfers, a free domain registration or transfer, free no-downtime website transfers, unlimited email accounts with IMAP, shared SSL, and 24/7 support. 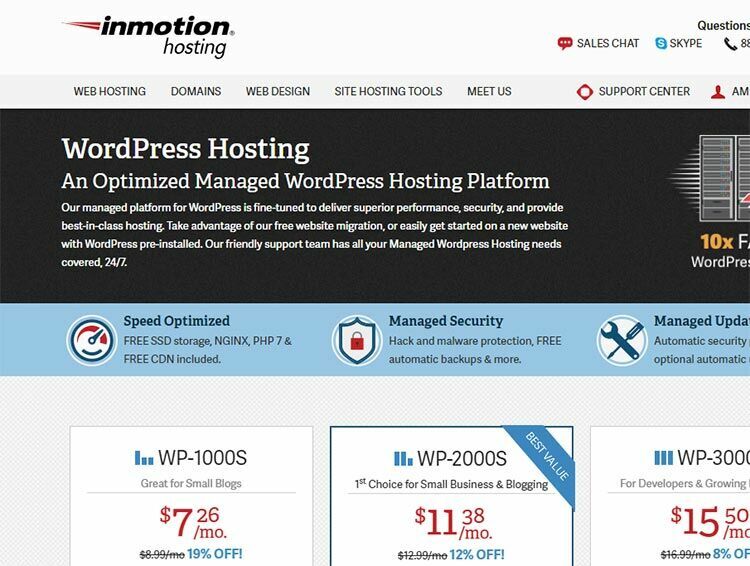 While InMotion brings a ton of value to the table, note that their basic plan does not come with eCommerce capabilities, so if you’re intending to sell products on your website, you’ll either have to pay for a more expensive plan, or go with a different WordPress host. Pricing: The basic plan starts at $6.39 per month. 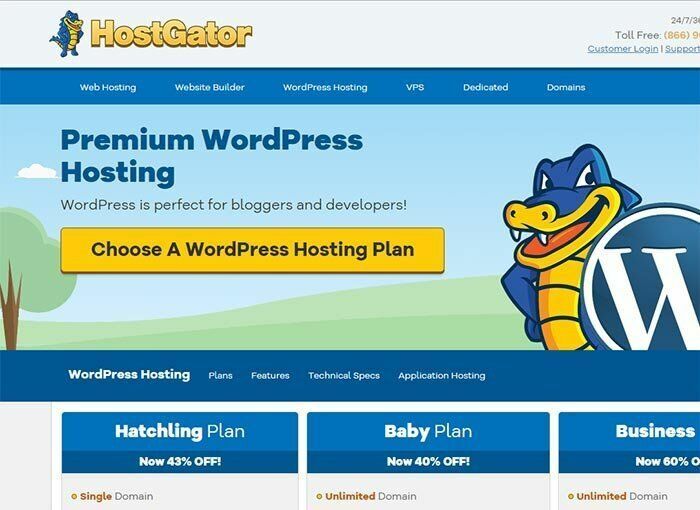 Hostgator hosts over 8 million domains; like Bluehost, they’re one of the biggest names in the WordPress hosting scene. Users who sign up for a basic plan with HostGator get 50 GB worth of storage, 1 GB of backup space, automatic database backups, a global CDN, unlimited email accounts, free migration, and 24/7/365 support. While HostGator’s basic plan is priced a little higher than that of its competitors, we appreciate that they guarantee a 99.99% uptime (if you experience more downtime than expected, they’ll be happy to credit one month back into your account). If you need some help setting up your account, you can reach out to HostGator via phone, email, or live chat. The support team is available 24/7, and we hear that HostGator’s CEO, Adam Farrar, even steps in to address support issues as and when is needed. Pricing: The basic plan starts at $5.95 per month. 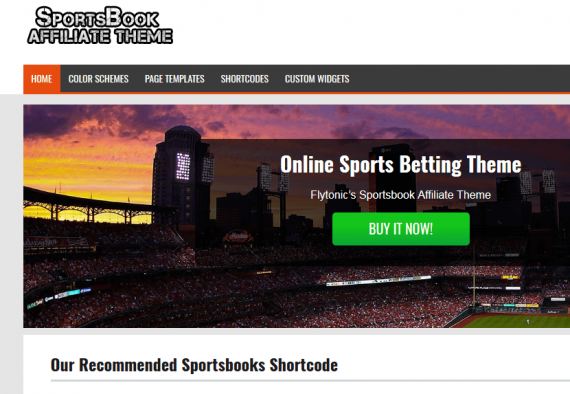 Flytonic is currently hosted on Siteground and we recommend any of the above hosts as discussed. They are all great WordPress hosts and can easily scale as your website grows.